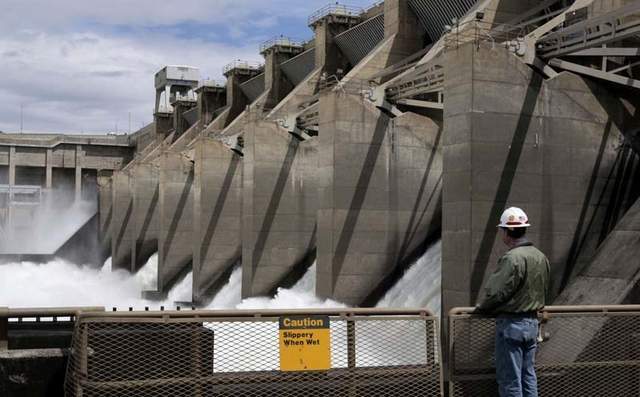 A combination of renewable energy, efficiency measures and energy-demand management can reliably replace power from four lower Snake River dams at relatively small additional cost, a new study out Wednesday asserts. The study, commissioned by the clean-energy focused organization Northwest Energy Coalition, comes two years after a judge ordered consideration of breaching the dams as federal agencies work on a new plan -- it would be the sixth, after five failures -- for protecting endangered steelhead and salmon in the Columbia River system. Advocates have long argued that breaching the dams would be a more effective -- and possibly cheaper, all things considered -- way to help the fish compared to programs they say are failing, and as the dams become more expensive to maintain. On the other side, a 2016 "fact sheet" from the Bonneville Power Administration, which markets power from federal dams in the region, including the Snake River dams, says that without the 3,033 megawatts of power provided by the dams, carbon emissions would rise and maintaining regional energy reliability would be prohibitively expensive. Northwest Energy Coalition representatives said the new study, using hour-by-hour data for the system, contradicts that. The study looked at several replacement scenarios, including one relying exclusively on new gas-fired generation, something skeptics have said would be the inevitable reality if the dams were breached. A non-gas scenario, however, would actually increase system reliability, and at lower additional cost than relying on gas, the study concluded. That scenario calls for 1,250 megawatts of new wind power -- an addition of about one-sixth of the region's current wind capacity -- and 250 megawatts of new solar. Costs of those renewable sources have been falling in the past several years. Lost power would also be made up through demand-response programs, where users are incentivized to reduce their energy use in order to trim peak demand, and investments in energy efficiency. If the cost of this approach were spread out over the entire Northwest, residential customers would see their bills rise about $1.28 a month, the study concluded. Greenhouse-gas emissions would increase slightly, less than 1 percent, as some existing gas plants run a bit more frequently. "The Lower Snake River Dams Power Replacement Study confirms clean, renewable resources can provide a viable and effective energy alternative to the continued operation of the dams," Northwest Energy Coalition said in a four-page summary of the study. "We can retire the dams and keep the lights on. The study also offers a framework from which the federal agencies can draw as they develop a new plan for dam operations." A key stakeholder group, representing public utilities that rely largely on the federal hydro system for their power, wasn't convinced. Scott Corwin, executive director of the Public Power Council, disputed the study on a number of counts, including the notion that "there is adequate reason and biological benefit to pursue this in the first place." And that $1.28 figure, he said, minimized the cost impact. "Even taking the assumptions here, this study still shows a very large cost to ratepayers of between $396 million and $1.2 billion annually," Corwin said in an email. "And, they wrongly show it spread across everyone in the region. In reality it would hit mostly on one customer group, and in largely rural areas." But a salmon advocacy that has long sought removal of the dams called the study "groundbreaking." "It delivers a bunch of information" that breaching skeptics have demanded, Joseph Bogaard, executive director of Seattle-based Save Our Wild Salmon, said. "They've said we can't replace with anything but natural gas, and this demonstrates clearly that isn't the case."